Deep In The Woods Lived A Witch Well Known For Her Potions. Desperate Travelers Would Brave The Depths Of The Dark Forest In Order To Consult With Her. Each game consists of multiple rounds. In each round, one player will be the dealer. (FOR the first round, randomly select the dealer. Shuffle the 33 game cards. Deal both players a hand of 13 cards. (each player may look at their own hand but should keep their hand hidden from the other player). Set aside the remaining 7 cards face down to make a draw deck. Take the top card of the draw deck and place it face up next to the draw deck. 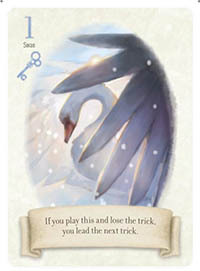 This card is known as the decree card . (THE suit of this card will be important during the round). Each round consists of a series of 13 turns for each player, called tricks. Every trick, both players will play one card from their hand face up into the middle: one player will lead (that is, play the first card of the trick), and the other player will then follow (that is, play the second card of the trick). 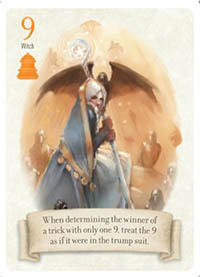 Based on the two cards that are played, one player will be said to win the trick. The woodcutter's daughter packed a bag with flint and steel, her food, and a long blanket. She set off into the woods, following one of her father's trails. Leading: The non-dealer leads on the first trick of a round. After that (unless specified otherwise), the winner of one trick will lead the following trick. The leader can choose to play any card from their hand, without restriction. The suit of that card is known as the lead suit for the trick. Following: After one player leads, the other player now must play a card that (if possible) matches the lead suit; that card can be (unless specified otherwise) of any rank in that suit. If the follower does not have a card in the lead suit, they may play any card without restriction. If either card in the trick is in the trump suit, the player who played the card in the trump suit with the highest rank wins the trick. If neither card in the trick is in the trump suit, the player who played the card in the lead suit with the highest rank wins the trick. The winner of the trick takes the two cards and keeps them face down near their side of the table. The number of tricks won by each player is public information, visible to both players during the round. However, no player may look at the faces of cards in previously won tricks. 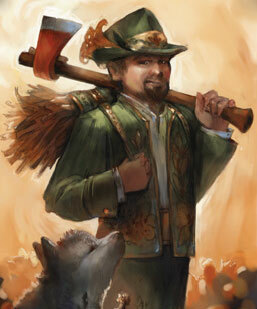 The woodcutter was known in the village as a brave man, unafraid of the forest's dangers. 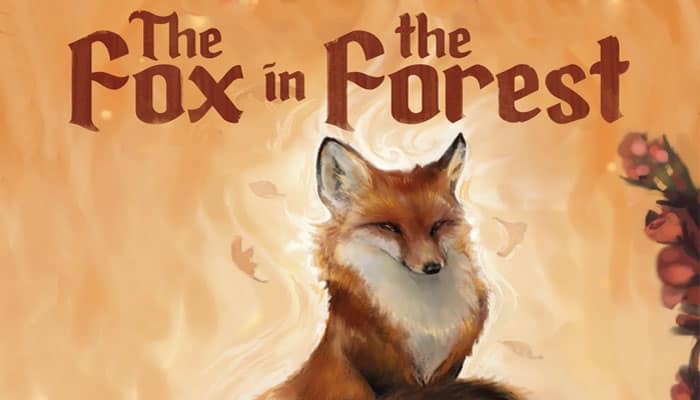 He would travel deep into the woods to bring back the best timber. 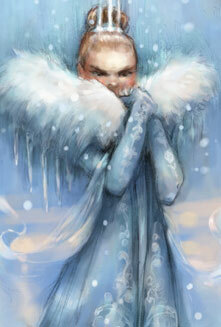 The queen decreed that whoever defeated the monsters would be granted half the kingdom in reward. Many second sons and daughters came from faraway lands to seek their fortune. All the cards of odd rank (1, 3, 5, 7, 9, and 11) have special abilities printed on them, which activate when the card is played. They may change what your opponent can play, how the winner of the trick is determined, or who leads the next trick; they may let you take a special action when you play the card; and they may give points to the winner of the trick. The exact timing of each ability is included in the text. After all 13 tricks have been played, count how many tricks each player has won. 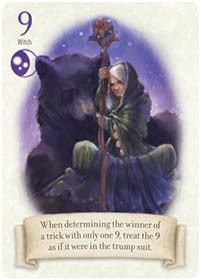 Players may win points at the end of the round, based on the number of tricks they won. (SEE the chart below). You want to win more tricks than your opponent, but not too many. (If you get too greedy, you will be brought down like the villain in so many fairy tales). After the end-of-round scoring, if either player has at least 21 points, then the game is over. Otherwise, play another round (with the dealer of the next round being the player who did not deal the current round). Play complete rounds until either player has at least 21 points. The player with the most points wins! If there is a tie, the player who won the most points during the last round wins. She entered the throne room. Her eyes beheld a precious treasure, unlike anything she had ever seen. Catching herself, she knelt respectfully before the monarch. 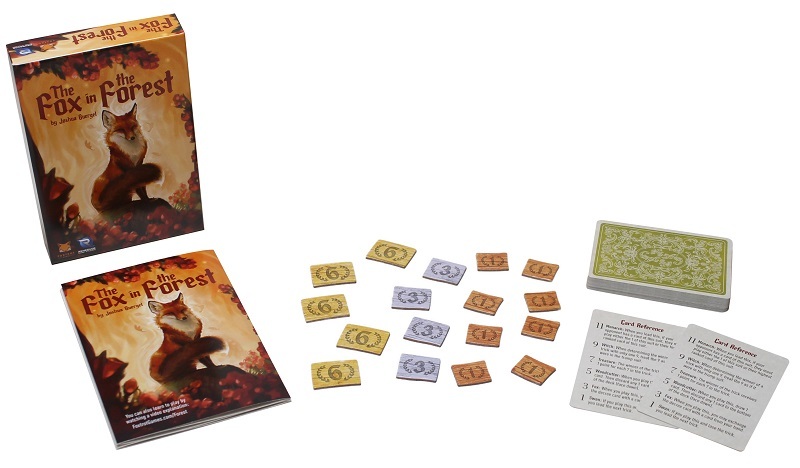 For a shorter game, we recommend playing complete rounds until either player has at least 16 points. For a longer game, we like playing complete rounds until either player has at least 35 points. (You will need a piece of paper and a pencil to record the higher scores).